Eurystheus Villa is a restored villa in the beautiful rustic village of Asteri. The thick stone walls and wooden ceilings leave the villa feeling warm in the winter and cool in the summer, giving the villa a unique traditional character. Entering through the main gated door you arrive in the pool area with the sun beds and umbrellas. A covered terrace runs at the back of the house and host a large wooden table and 6 chairs ideal for outdoor dining. A grassed area runs along the side of the villa and here the owner Manolis has planted two orange trees, a lemon tree and a mandarin tree. First impressions one can see the quality of the villa. Entering into the house, there is an open plan kitchen with dining area leading to the living room. Also on this level is a bathroom with hydro massage cubical shower. Going upstairs by the wooden staircase, there are 3 bedrooms, one bedroom with double bed and 2 twin bedrooms with beds. 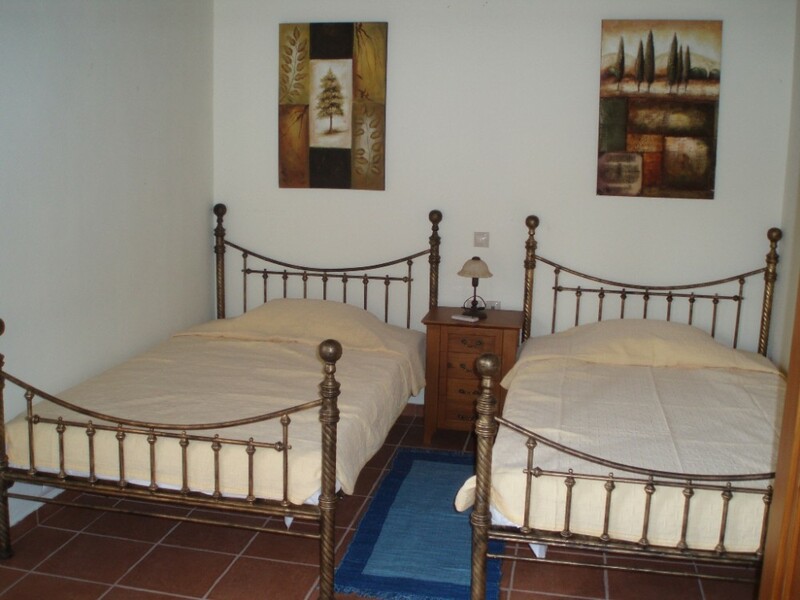 From the bedrooms one can exit to the balconies and enjoy the lovely views to the village and the countryside. The second family bathroom with a large Jacuzzi bathtub and twin basins is also located on this floor. The village itself has two cafeneons and a tavern serving local traditional cuisine a few meters away. The village is very quiet and nice and everybody will feel and taste the real Cretan hospitality. Children are welcome and can walk and play in the village feeling safe so that parents will not have to worry. The people of the village will include you in their company and will make you feel at home. The distance to the sea, supermarket, bakery and petrol station is just 2 km. The location and quality of the villa and the distance to the amenities will make your holidays unforgettable. The town of Rethymno where one can find a larger variety of shops, tavernas and facilities is just 14 km. away or about 15 minutes drive. A car is considered to be essential for exploring the area and the whole island.